Canyon Lake, CA – Our historic drought created a thirsty region for Southern Californians. In the southwest portion of Riverside County, Lake Elsinore reached low lake levels suffering algae blooms over the hot summer months. Recent storms hit hard, bringing much needed rain and snow. In the San Jacinto and Lake Elsinore Watersheds, snowmelt and rain flow downward and end up in Canyon Lake and eventually Lake Elsinore. As water enters Canyon Lake, along with it comes an increase in excess nutrients and sedimentation. Alum treatments to Canyon Lake have been effective in reducing nutrients and sediment concentrations related to flows of nutrients that enter the lake. An alum application has been scheduled for February 7- 10, pending final testing and recommendation from scientists. The Lake Elsinore & San Jacinto Watersheds Authority (LESJWA) is responsible for managing the alum applications. LESJWA, a joint powers authority, exists to improve water quality in Canyon Lake and Lake Elsinore within the watershed. Canyon Lake has a history of receiving high levels of nitrogen and phosphorus that enter the lake through water run off. By reducing nutrients in the lake, the severity of algae blooms decreases, as algae feeds on phosphorus. In order to comply with water quality regulations, enforced by the State through the local Santa Ana Regional Water Quality Control Board, the Lake Elsinore & Canyon Lake Nutrient Total Maximum Daily Load (TMDL) Task Force continues to conduct alum water treatments in Canyon Lake. The TMDL Task Force evaluated several options and determined that alum application provides the best option as a step to effectively treat the entire lake in a timely manner with minimal impact to Canyon Lake residents. 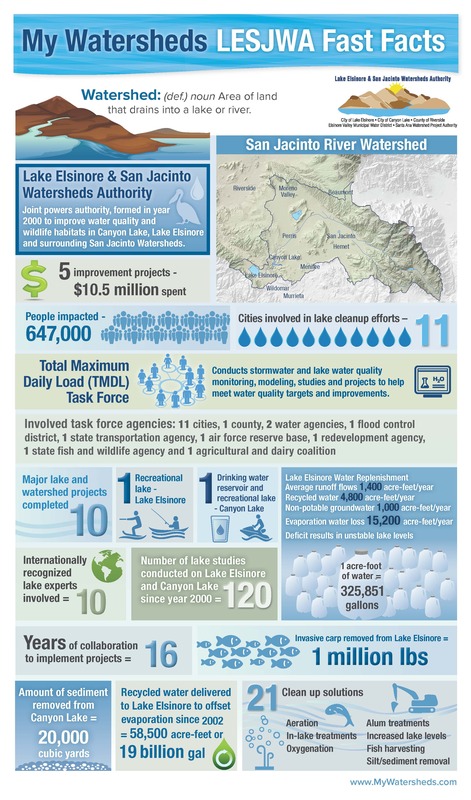 Funding for the alum applications is being provided by the Lake Elsinore and Canyon Lake Total Maximum Daily Load (TMDL) Task Force, which consists of cities, the County of Riverside, agriculture and dairy coalitions and other organizations in the San Jacinto River watershed. Implementation of the alum project is being coordinated by the City of Canyon Lake, the Elsinore Valley Municipal Water District, LESJWA, the TMDL Task Force and the Canyon Lake Property Owners Association.